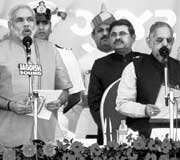 Narendra Modi takes oath on Tuesday at the Sardar Patel stadium in Ahmedabad. Ahmedabad: Arguably India’s most divisive politician, Narendra Modi, was sworn in Tuesday for a third term as chief minister in Gujarat. He was the only one to take oath on Tuesday. The Bharatiya Janata Party (BJP) leadership was present in full strength, led by its prime ministerial candidate L.K. Advani and Rajnath Singh. Thousands of supporters waving saffron flags gathered at the stadium here to watch Modi take the oath of office after the BJP swept state elections, defeating the Congress party, which heads the government at the Centre. The BJP won 117 seats in the 182-seat state assembly in elections held in two phases earlier this month. Congress won 62 seats, and independents took three. The election win has been seen as a personal victory for Modi after a bitter campaign fought in the shadow of anti-Muslim riots that left more than 1,000 people dead in 2002. Throughout the campaign, Modi cast the election as a referendum on his rule—a tenure best known for the riots, which began after a mysterious fire killed 59 Hindu pilgrims on the Sabarmati Express. Many charge Modi with standing idly by as Hindu mobs killed Muslims, who were blamed for setting the Sabarmati Express afire. While the Congress campaign focused on the riots, Modi highlighted the state’s economic growth under his leadership—the state reportedly attracted more than 25% of India’s total foreign investment of $15.7 billion (Rs62,015 crore) in the last fiscal year. He cast himself as the common man, a teetotaller and one-time tea vendor well acquainted with the everyday struggles of ordinary Indians. The election had been viewed as a test of strength for the parties amid persistent talk of possible early national elections. ?Modi?faced?the first polls in 2002, just a year after taking over from Keshubhai Patel.